14TB, the amount of data that can be held by Seagate’s latest flagship $600 IronWolf Pro, is a whole lot of digital stuff. Way more than most users need, unless of course, said user is capturing raw 4K or 8K video. In that case, the more the merrier. Seagate’s BarraCuda Pro and non-pro IronWolf are the only other drives in the consumer space that can fit that much (WD has a 14TB enterprise drive), but guess what? The IronWolf Pro is a bit faster. A bit more expensive, of course, but top banana is top banana no matter how you slice it. The key differentiator between the 14TB IronWolf Pro and the 14TB BarraCuda Pro is the former’s vibration detection, which Seagate says will ward off read/write head tracking issues when you pack two or more drives together in close proximity. That is, the vibration from one drive will be sensed by the other and compensated for. I specify 14TB because performance and features in both the BarraCuda and IronWolf lines vary quite a bit by capacity. In other words, this is not a review of the entire line-up. 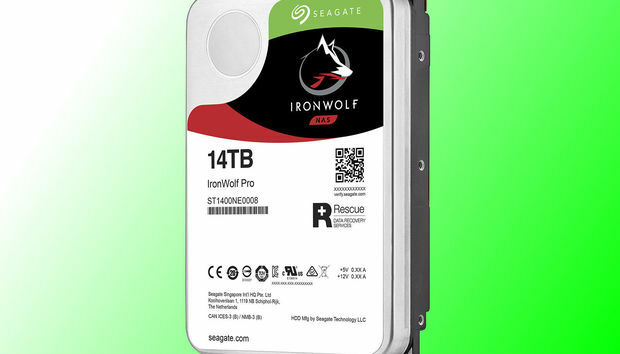 Seagate provides spec sheets for all the different IronWolf Pro models online. 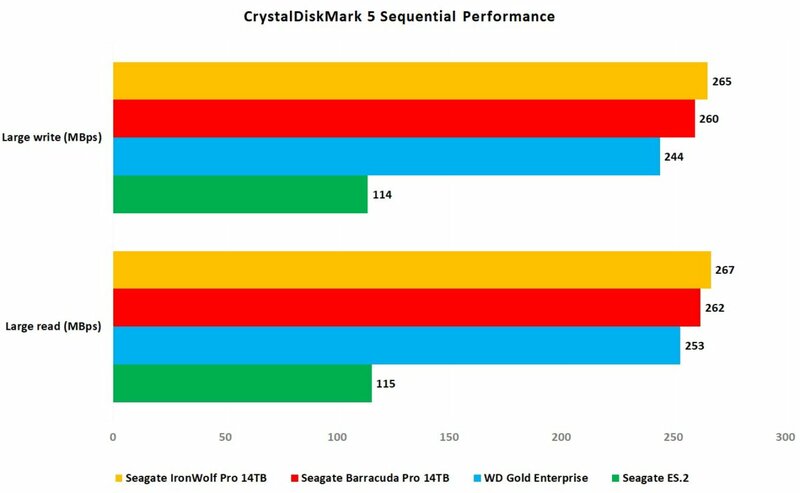 While the performance advantage for the IronWolf Pro (gold bars) over the BarraCuda Pro isn’t huge, it was a consistent 5MBps across the synthetic benchmarks (CrystalDiskMark 5 and AS SSD 1.9). That makes the IronWolf Pro fastest hard drive we’ve ever tested. Note that sequential performance is how fast the drive can read and write contiguous data, i.e., a single large file, not separate files that must each be apportioned a location and directory entry. IronWolf Pro. Longer bars are better. 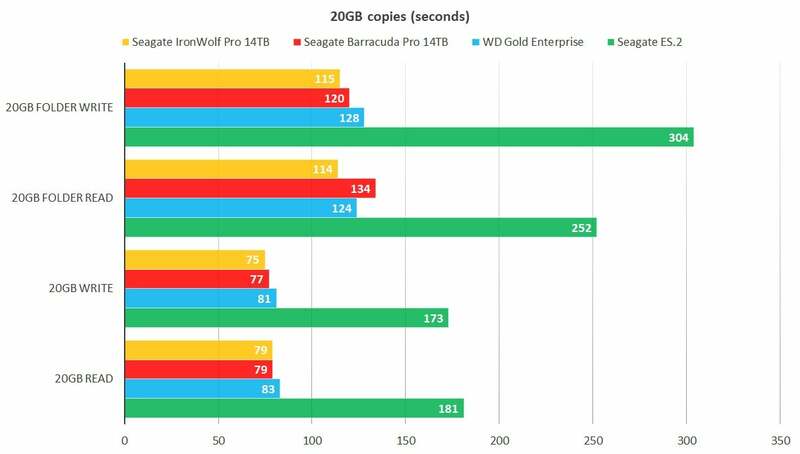 We didn’t test the lower-capacity 2TB through 12TB IronWolf Pro drives, but Seagate’s performance claims decrease progressively with each drop in capacity. You can see the results for the 12TB IronWolf (plain) model here. Note that hard drive speeds decrease a bit as the drive fills up. This is because writing and reading to the inner tracks isn’t as quick as writing to the outer tracks. The 4TB and larger IronWolf Pro drives feature Seagate’s IHM (IronWolf Health Management), which interfaces with NAS boxes from Synology, Thecus, and AsusStor (with more vendors on the way) to provide extensive monitoring of the IronWolf’s vital signs. The 1TB and 2TB models do not. The IronWolf Pro 14TB is easily the best hard drive available for the general consumer. The plain IronWolf is $70 cheaper, and a worthy drive in the 12TB version, but we have not yet tested the 14TB drive yet. The $20 cheaper BarraCuda Pro is a fine drive in its own right, but budget concerns aside, the IronWolf Pro is our pick. Our standard advice with a drive this large is to use the redundancy of a RAID 1 mirror (two drives, same data) as an easy, if very expensive hedge against data disaster. Data recovery success is not a given, and shouldn’t be thought of as an alternative to backup. As a side benefit, a mirrored array allows you to keep working in the case of drive degradation or failure.